British police have arrested a 47-year-old man for trying to illegally sell a stuffed Bengal tiger that the late fashion designer Alexander McQueen used in a photo shoot. McQueen used the beast, which is an endangered species, last October to promote a line of footware he designed for the Puma sports brand. The man, whom police have not named, was held for trying to get £50,000 for the tiger. The Bengal tiger has attracted controversy since it was bought by photographer Nick Knight, 52, from a German zoo in 2009. It was being kept at SHOW studio at Burton place, London, which was set up by Knight for the storage and selling of one-of-a-kind props from fashion shoots. Article eight of the Convention on the International Trade of Endangered Species (CITES) regulates the laws for trading taxidermied animals. 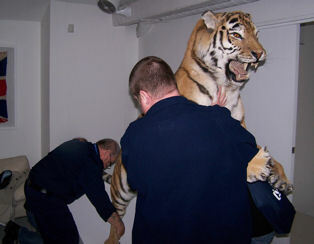 The unnamed man failed to produce sufficient documentation to verify its origin and the tiger was seized by the Metropolitan Police who were helped by the National Wildlife Crime Unit (WCU) and Hertfordshire Constabulary. "In order to discourage the trade in rare animals and related items, it is crucial that regulations surrounding their sale are strictly enforced”, says detective Sgt Ian Knox from the WCU. He added: "Where an item is suspected of breaching the CITES regulations designed to protect our planet's most endangered flora and fauna, we will take the appropriate action to establish its origin and, when necessary, seize it as evidence”. McQueen featured the wild beast, which is an endangered species, last October to promote a line of footware he designed for the Puma sports brand. The man, whom police have not named, was held for trying to get £50,000 for the tiger. It is only legal to sell a stuffed tiger in the UK if it is classified as an antique.